San Jose's Japantown (Nihonmachi) developed from where the immigrant Japanese first settled in Santa Clara Valley. More than a century following its humble beginnings, it remains one of the last three historical Japantowns in the United States. 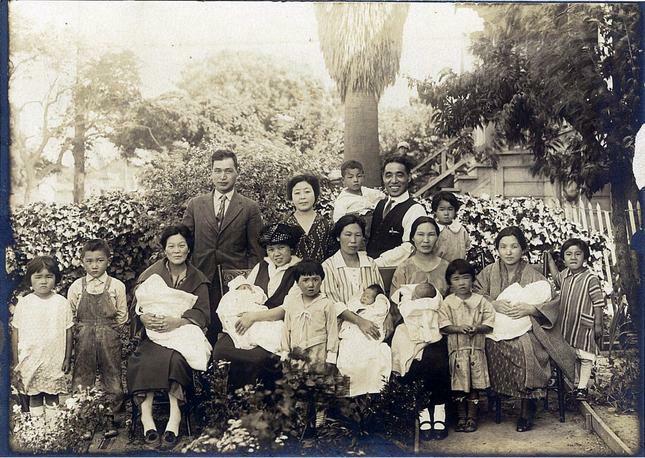 Without an established community of their own, these Issei (first generation) pioneers found refuge in San Jose's Chinatown (called "Heinlenville" by locals after John Heinlen, the man who built it) located north of the downtown area. Around 1890, the Japanese came to the Santa Clara Valley because of the abundant farm work. Without an established community of their own, these Issei (first generation) pioneers found refuge in San Jose's Chinatown (called "Heinlenville" by locals after John Heinlen, the man who built it) located north of the downtown area. As an Asian town center, Chinatown offered familiar lodging, entertainment, restaurants and shops providing comfort and safety from prevailing anti-Asian racism. By the early 20th century, the Japanese established their own community that flourished alongside Chinatown. Now, they could find cultural support, employment, goods, shelter and a social life that were uniquely Japanese. 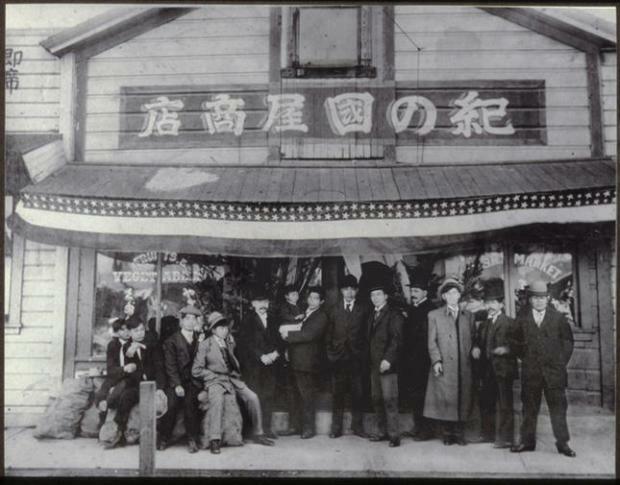 At first, Nihonmachi mostly served the bachelor migrant workers and Japanese farmers who came into town for supplies. But as more Japanese women settled in the United States (thanks to the Gentlemen's Agreement of 1907), there was an emergence of family life in the community as the earliest Nisei (children of the Issei) were born. Nihonmachi flourished as more Japanese made the Valley their permanent home. It was during this time that some of the most famous neighborhood buildings, such as the Kuwabara Hospital (Issei Memorial Building), the Taihei Hotel and Okida Hall, were constructed. Courtesy JAMsj - Mothers with their children in an undated photo, taken in front of the home of Chiyo Amemiya, who was a registered mid-wife. Many women gave birth to their children at the Amemiya midwifery, located at 629 North Sixth Street in San Jose's "Japantown." The home still stands to this day. Through the 1920s and the Great Depression, Japantown experienced a slow but steady development. The neighborhood transformed from wooden walkways and dirt roads to sidewalks and paved streets with automobile traffic. Two gas stations opened to serve the newly mobilized society. Merchants built new stores and restaurants, the first American-educated Japanese doctor (Dr. Lee Watanabe) opened his office, and the San Jose Buddhist Church had a magnificent new temple constructed. Unfortunately, the economic downturn and anti-Chinese immigration laws dealt a deathblow to neighboring Chinatown as its population dwindled and the City of San Jose seized the land from the bankrupt Heinlen Estate. By 1931, the City began razing Chinatown, turning the once vital community into a storage yard. Nihonmachi became the main Asian-friendly neighborhood as a new wave of immigrants, the Filipinos, began settling in the Valley. Japantown's development came to an abrupt halt in May 1942. War hysteria and the general suspicion of the Japanese prompted a national order where all people of Japanese ancestry, even U.S. citizens, were forced to leave the Valley. The Japanese either relocated to an internment camp or resettled in areas far from the West Coast. During the years that the Japanese were away from the Valley, most buildings were vacant. Nihonmachi was a ghost town save for a couple of Jackson Street businesses and the Filipino and Chinese businesses on 6th Street. 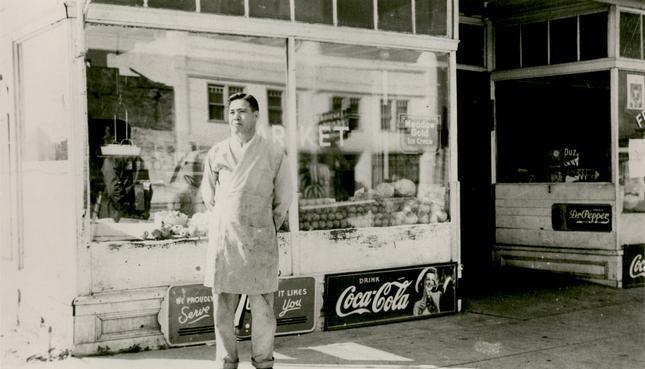 Courtesy JAMsj - Yoshijiro Santo photographed post-WWII in front of the grocery he opened in San Jose's "Japantown" and operated with his wife, Misaye. In 1945, the Japanese were allowed to return to the West Coast. The post-World War II years became a watershed moment for Nihonmachi as it provided a place where former and new Japanese residents felt protected from anti-Japanese racial hysteria. Japantown's fortunes benefited from its location in Santa Clara Valley, one of the most tolerant regions for Japanese. By the end of the decade, the population of Japanese Americans in San Jose had nearly doubled. The 1950s and 1960s were peak years of activity for Japantown, with three generations of Japanese coming and going through the busy neighborhood. The 1970s saw the aging Issei community passing away and further acculturation of the Japanese into mainstream American culture. These changes eroded Japantown's role in daily Japanese American life, and the neighborhood suffered a decline. Among the many challenges for the Nisei was to provide for the aging Japanese population and establish resources to keep the community vital. Out of the counterculture and anti war movements of the late 1960s, the political activism of the Sansei (third generation) sparked a cultural awareness that bolstered efforts to renew Japantown. There is an awareness that Japantown has always been made up of residents and small businesses. No one corporation, organization or family runs Nihonmachi. Starting in the 1980s, Japantown has gone through a series of redevelopments entailing everything from upgrading building facades to constructing new housing complexes to planning for the development of the land that was once Chinatown. The installation of historic markers and plaques identify and preserve the rich heritage of the neighborhood. Capital improvements and preservation efforts have been made with extensive dialog with people and merchants in the community. There is an awareness that Japantown has always been made up of residents and small businesses. No one corporation, organization or family runs Nihonmachi. Perhaps this has been the strength of Japantown, the fact that its fate relies on the dedication of individuals and not on decisions made by a board of directors. Today, the Yonsei and Gosei play a greater role in a community that is becoming more diverse than ever. Japantown's role in the lives of Japanese Americans is different today than when it was founded. Nevertheless its importance as a cultural treasure and a vibrant community remains undiminished. 1 Curt Fukuda is co-author of a book on the history of San Jose Japantown (Amazon, "San Jose Japantown: A Journey").